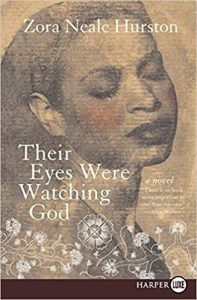 Written by Zora Neale Hurston, the novel and later turned movie Their Eyes Were Watching God is regarded as an important piece of history. While fictitious in nature, the novel is viewed as one of the first major publications ever written by a black woman. It follows the life of attractive and confident African-American woman Janie Crawford and her return the Eatonville, Florida. Having been away from the town for so long, the locals can’t help but to gossip about her extended absence and spread rumors about the whereabouts of her husband, Tea Cake. The townspeople mistake the young woman’s confidence for standoffishness, but her long-time friend, Pheoby Watson is quick to come to her defense. Wanting to gather the truth, Pheoby visits Janie and the two begin to discuss the events leading up to her return to Eatonville, and the tone for the storyline is set. Janie explains that her mother had abandoned her, leaving her to be reared by her maternal grandmother, Nanny. Nanny is devoted to her granddaughter and wishes to give her the best life possible. However, having lived most of her life as a slave, and the challenges of raising Janie’s mother have left her with a sordid view of the world and the people in it. Because of the animosity she harbors for society, her chief goal is to marry off Janie to a well-to-do suitor who can offer her both security and superior social status. Nanny introduces Janie to Logan Killicks, a farmer who is many years her senior, and is insistent that the two be wed. Reluctantly, Janie moves in with Logan, but she is exceedingly miserable. Logan is hard-headed and incapable of romancing a young woman. He treats Janie more like one of his farm animals than he does a woman or lover. Soon, Janie crosses paths with the dapper and ambitious Joe Starks and the two begin to flirt in secret. It is all innocent at first, but several weeks later she runs away with him and the two elope. Janie and her new husband, Jody as she refers to him, journey to Eatonville, an all-Black community in Florida. While there, Jody wishes to have a ‘big voice.’ He is a politician and eventually becomes the town’s Mayor, postmaster, shop keep and most affluent landlord and property owner. However, despite all of his success, Janie still feels unfulfilled. She yearns for something more than a man with a ‘big voice.’ She is overcome with boredom and feels that life have become complacent. She fantasizes about becoming a prominent contributor to the rich social circles of the town. However, Jody feels firmly that those types of people are beneath her and forbids her to interact with the common townspeople. Jody views Janie as a trophy, a projection of his wealth and power. He attempts to mold her into something more fitting of the wife of the mayor. On the outside, Janie submits to her husband’s demands, however, the passion inside of her continues to burn. For nearly two decades, Janie continues to endure the demands of the man she married until she can no longer take the belittlement. One day, after Jody insults her appearance, she asserts herself and turns him into a shell of a man when she tells the townspeople what kind of man he really is – impotent and ugly. Out of anger, Jody beats Janie and their marriage falls apart. Jody falls ill and Janie visits him on his deathbed, wanting to face him and chastise him for the way he had treated her throughout their entire marriage – despite her having supported him and his many pursuits. As she scolds him, he passes away. After Jody’s funeral has ended, and his coffin is lowered into the ground, Janie feels an overwhelming sense of calm come over her. For the first time in many, many years she is free. She turns away many potential suitors as she enjoys her new found independence far too much. However, all of that changes when she meets Tea Cake, a man twelve years her junior. Immediately, Janie is overcome by powerful emotions, there is a strong sense of attraction between the two. Despite that gossip of the townspeople, Janie quickly marries Tea – only nine months after the passing of her first husband – and the two sell Jody’s shop and relocate to Jacksonville. During their first month as a married couple, the two begin to have marital difficulties. Tea steals her money and leaves her alone one evening. This causes Janie to feel that he had only married her for her money. However, he soon returns and explains to Janie that his intention was never to leave her and that he had succumb to a moment of weakness. It is then that the couple vow to always be honest with each other. They relocate to the Everglades, and take up seasonal jobs during the harvest season and socialize during the off months. Tea’s charm and quick wit make their home the best place to be for entertainment and social gathering. Two years into their marriage, their home is destroyed by a hurricane. As the two attempt to flee, Tea is bitten by a rabid dog. This causes him to fall into a fit of rabies induced hysteria. The madness has convinced him that Janie is having an affair. He takes aim with his pistol and begins to fire at her. Janie is forced to kill him in order to save herself. She is arrested for murder, but an all-male, all-white jury finds her not guilty. After all is said and done, she returns to Eatonville only to find that her former neighbors and friends are all too quick to start horrible rumors – insisting that Tea had only married her for her money and had left her once he had bled her dry. As Janie finishes sharing her story with Pheoby, who is in awe at what her friend has endured, she returns to her room and feels an overwhelming sense of calm come over her. Janie is the central character of the novel, and she seeks to defy stereotypes. And, while a strong and independent black female, she has strikingly ‘Caucasian-like straight hair’; a trait she has inherited as a result of her mixed ancestry. She further asserts herself by wearing overalls in an era where all women dressed in dresses. She is a confident and curious woman, she recognizes early on that those who are cruel to her are the way they are because they were raised with limited views of the world and not because they are intentionally mean. Tea Cake is the third husband to Janie, and her first true authentic love. She is twelve years his senior, but despite their notable age difference he attracts her with his quick wit and a desire for life. He appears to genuinely understand Janie, and cares for her deeply. Unlike her other suitors, Tea never attempts to try to make Janie someone she is not and shows her unprecedented respect. That being said, he is not an innocent man. Despite his affections for her, he did at one time beat her and rob her. It is these weaknesses, however, that position him as a real character, with real troubles and real tribulations. Jody is Janie’s second husband, a man that she once thought she loved. Janie follows Jody from Georgia to Eatonville in order to satisfy his desires to build a life of power and fortune. Jody is an experienced politician and businessman, he quickly becomes the town’s mayor, shop keeper, postmaster and most prominent landlord. However, he treats Janie like one of his possessions and does not show her the care and respect that a wife deserves. Their marriage survives two decades, but eventually falls apart. Well-to-do, older farmer, Logan is the first husband of Janie. The two wed at the insistence of Janie’s grandmother, who feels strongly that financial security trumps love. Logan spoils Janie for nearly a year, but soon tries to get her to help on the farm. Janie begins to feel used and unloved and flees her marriage. Pheoby is Janie’s only true friend in Eatonville. She comes to Janie’s defense when the townspeople spread horrible rumors about her, and encourages Janie to tell her the truth. She serves as the audience for Janie’s story. Nanny raised Janie after her mother abandoned her. Her previous life as a slave has dampened her views of the world and led her to believe strongly that a woman must have financial security and strong social status in order to survive. Although she means well, and only wants the best for her granddaughter, her views and Janie’s own search for independence and personal growth clash early on. The Turners live in the Everglades and operate a small restaurant. Mrs. Turner values her white features and looks poorly upon anyone with a strong African appearance. In fact, she praises Janie because of her white features and is unable to understand why Janie would ever marry a man as dark skinned as Tea. She wants to introduce her to her brother. Sam is Pheoby’s husband. He is an avid conversationalist and comes to the aid of Jody when the townspeople begin to regard their resentment for him. Leafy is Janie’s absent mother. She gave birth to Janie just before the end of the Civil War and abandoned her when she was only a newborn. A resident of Eatonville, Amos is unsuccessful in his attempts to steal Janie from Jody. Nunkie is a young woman from the Everglades. She is very flirtatious towards Tea Cake. However, after Tea reassures Janie that he only loves her, Nunkie is never mentioned in the novel again. As is the case in many novels with strong African-American characters, hair plays an important role in Their Eyes Were Watching God. To Janie, her hair is a symbol of power and identity. It is representative of her individuality and strength in three ways. Initially, her hair is representative of her independence and refusal to conform. At the start of the novel, the townspeople are overhead proclaiming that only undignified women wear their hair down. Secondly, her hair acts a phallic symbol. Her braid is often the source of controversy, with people regarding it as masculine. Lastly, her hair is straight – regarded as a white trait – a characteristic that some believe provides her with a sense of privilege often only reserved for white males. The pear tree is representative of Janie’s pure views of nature. In the way that the bees interact with the flowers of the pear tree, Janie sees a perfect and natural moment, something that is akin to blissful harmony. She chases after this ideal throughout the duration of the novel. The hurricane is said to represent that true fury of nature. It acts in a manner that is the true opposite of the pear tree. Instead of bringing life, it destroys it. The hurricane causes the characters to question their place in the world. It is not a source of beauty, it is a source of destruction, one that makes those affected question whether God cares for them at all. Janie wonders why or how she will ever survive in a world that is filled with so much pain and chaos. Foreshadowing: In Chapter 1, the audience learns that Janie has been away from the town of Eatonville for quite some time. It is noted that she ran away with a much younger man and the two married. Janie shares the details of her life with her friend, Pheoby. Her story starts when she tells Pheoby that Tea Cake is ‘gone’ and so her story begins. In this quote, read at the start of Their Eyes Were Watching God, the tone for the novel is set. It speaks volumes of the peculiar perception of gender roles and indifferences. Not only is this novel about a woman, it is also the first major novel ever published by a black female author. This book has been frequently considered a ‘feminist novel’ However, feminism is regularly supported by the idea that men and women are equal. Yet, in the novel, the narrator frequently establishes the differences between men and women. The novel speaks to the fact that men and women need certain things from each other. A point that is supported in Janie’s quest for a male partner who can not only complement her, but also provide her with the life she yearns for. Read in chapter two, this passage speaks to the start of Janie’s spiritual and sexual awakening. She is a young woman, being cared for by her grandmother, and it is in this moment that she is encouraged to live out her life to its fullest potential. She is unwilling to settle. The sweet embrace of the bee and the flower becomes the vision that Janie uses to idolize love. “It was inevitable that she should accept any inconsistency and cruelty from her deity as all good worshippers do from theirs. All gods who receive homage are cruel. All gods dispense suffering without reason. Otherwise they would not be worshipped. Through indiscriminate suffering men know fear and fear is the most divine emotion. It is the stones for altars and the beginning of wisdom. Half gods are worshipped in wine and flowers. Real gods require blood. Taken from chapter sixteen, the author offers an exception to the gender dichotomy presented in the opening passage of the novel. Mrs. Turner idolizes the qualities that she herself will never possess, and what is perhaps most unusual about this quote is that there is an implicit comparison between herself and Janie. The ‘real blood’ and ‘indiscriminate suffer’ that might lead to wisdom could equally be the suffering and wisdom of Janie. Spoken in Chapter eighteen, this passage summarizes the entire conflict of the book, when Janie, Tea Cake and Motor Boat seek solace from the disastrous hurricane. Their struggle speaks volumes of the plight of man against nature and the struggles between man and God. It is huge that Motor Boat joins Janie and Tea, and assists them in the struggle. At this exact moment, everyone is considered equal and the bond between men in their darkest hour is unwavering.